Are you wearing your personality? So often we are focussed on what fits, what's in fashion, and playing by the 'rules' that we forget what we actually like! Finding a style that represents your personality means you get to wear clothes that excite you and make you feel confident. You're being YOU and it shows. People start saying 'Wow you look great' and it's not your shoes, it's your personality! There are a few things you'll need to let go first, some of the not so nice thoughts about your wobbly bits, and some self doubt, but you can do it and you'll feel so much better for it. I'm here to make fashion fun again and help you SHOW UP for your life every day. I offer three options for Personal Styling - get started with just one, or choose all three to get the full experience! 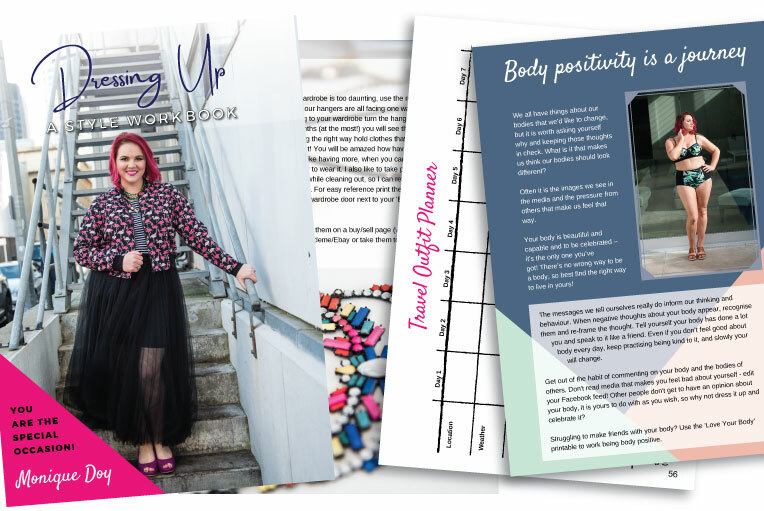 The Dressing Up Style Workbook will help you to reevaluate your wardrobe (and clean it out! ), rediscover what you love, appreciate your body and never say 'I have nothing to wear!' ever again. When you book a wardrobe edit with me you will feel more confident in your body and your personal style, have photos of outfits to grab and put on at a moments notice and know EXACTLY what to buy next time you go shopping. I am based in Auckland and can also plan a shopping trip to meet your needs. I specialise in dressing you to represent your brand and working with women sizes 14+. Book a free half hour chat with me to see how I can help! - Shopping Trip (2 hours, extra hours additional).